Kazakhstan is located in Central Asia, northwest of China; a small portion west of the Ural River in eastern-most Europe, comprising of 2,717,300 sq km. It has a population of 15,185,844 (2005). 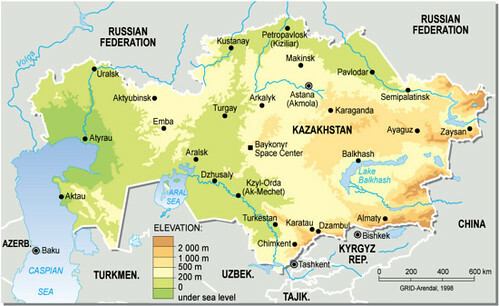 Major environmental concerns are: radioactive or toxic chemical sites associated with former defense industries and test ranges scattered throughout the country pose health risks for humans and animals; industrial pollution is severe in some cities; because the two main rivers which flowed into the Aral Sea have been diverted for irrigation, it is drying up and leaving behind a harmful layer of chemical pesticides and natural salts; these substances are then picked up by the wind and blown into noxious dust storms; pollution in the Caspian Sea; soil pollution from overuse of agricultural chemicals and salination from poor infrastructure and wasteful irrigation practices. For any form of publication, please include the link to this page and give the creator credit (in this case Philippe Rekacewicz, Emmanuelle Bournay, UNEP/GRID-Arendal) If the high-resolution file is not available, please contact grid@grida.no for request and permission for usage.